Johnson Controls (JCI) delivers products, services and solutions that increase energy efficiency and lower operating costs in buildings for more than one million customers. They are a leading international provider of automotive experience, power solutions and energy efficiency and have been involved in more than 500 renewable energy projects including solar, wind and geothermal technologies. 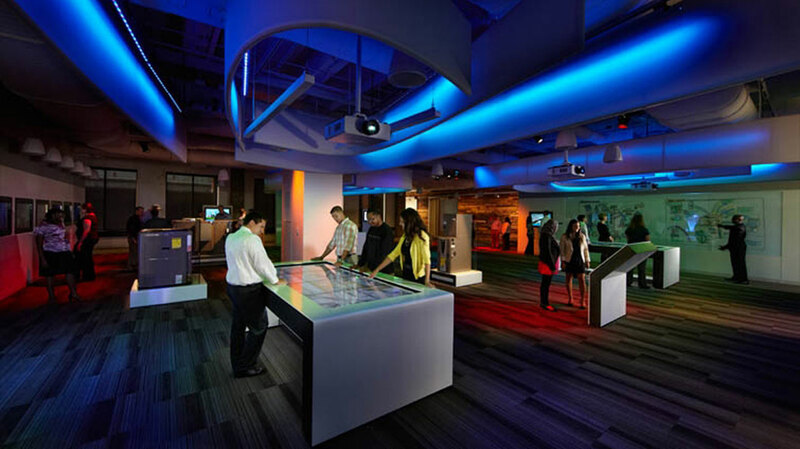 Headquartered in Milwaukee, Wisconsin, JCI commissioned a Technology Experience Center (TEC) to house 17 different interactive experiences to excite potential international clients about their offerings. 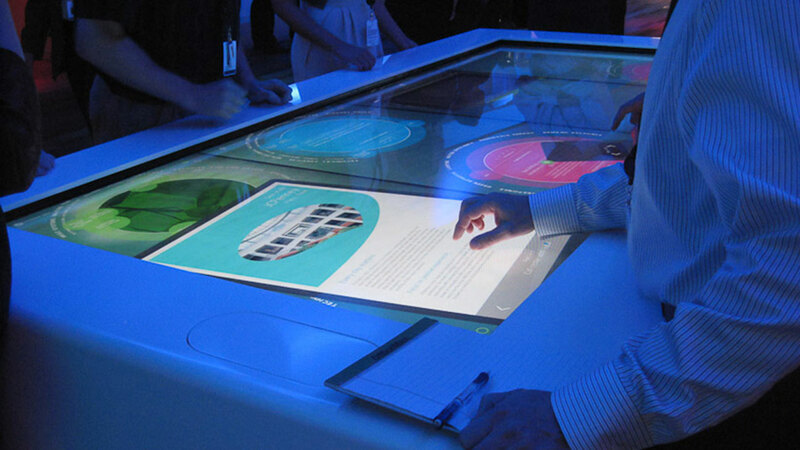 The environment’s objective is to inform visitors about complex product information in an intuitive and fun way. The TEC was fully customizable with a back-end content management system so that the whole center could be uniquely tailored to its visiting clients. It proved successful in showcasing JCI’s offerings to their customers in one eye-catching space that left clients wanting more! 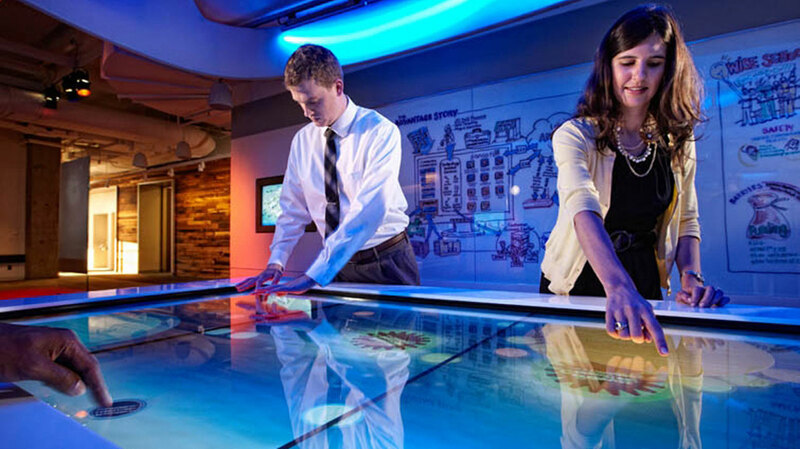 Grand Point was brought on to work with Downstream in Portland, Oregon, to lead the design for two 4.6-meter wide PQ Labs Touch Overlay touch-screen table large interactive tables for the TEC. 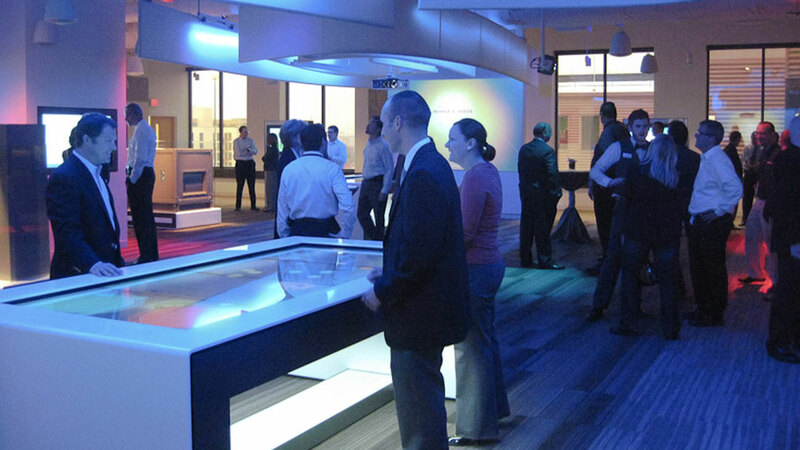 Each table featured unique user experiences, motion sensors that delivered special content if a certain amount of people were around the tables at a time, and secret multi-touch finger codes to unlock administrator features. 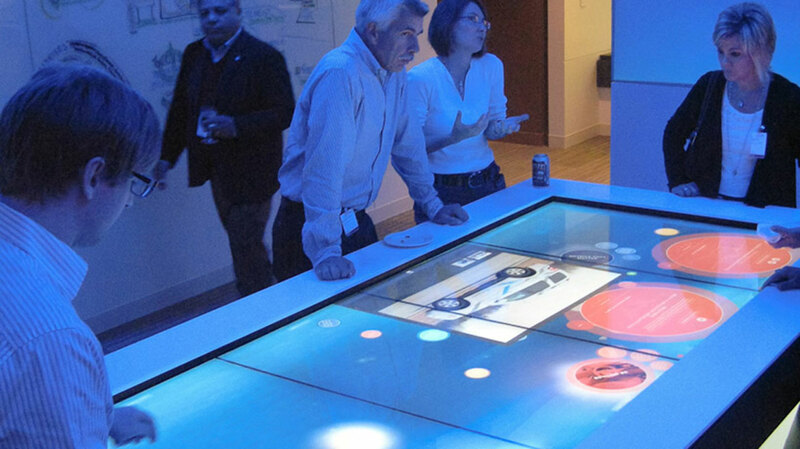 The Leadership Interactive powered by flexible CMS backend, functions as a “water stream” where different items related to Johnson Controls’ leadership, vision and expertise float through the table and within the reach of users gathered around it. The interactive attracts visitors with sounds of a bubbling brook and floating particles that vary in depth in the flowing water stream. In attract mode, the industry bubbles are in an ambient state as the particles contained within the bubbles gather to form the titles of each industry. The animation of each particle build is thematically tied to the title of the industry bubbles. While transitioning out of attract mode after user-initiation, the industry bubbles cycle through video that come in and out of focus while the particles animate to reveal different “power words” to describe the industry tier. The Lifecycle Interactive allows users to experience the interconnected nature of Johnson Controls’ offerings by simplifying the connections between phases and services. These phases represent interactive hubs on the table that can simply display how the products, services and technologies they contain reach out to touch other phases. Users can dive into layers of content for their own Lifecycle phase, the offerings contained within and filter content to their unique needs. Analyzing the hierarchy and relationships between the typical building lifecycle, JCI’s products and services, and their potential value, is expressed through time. In attract mode, the particles are surrounded by micro-content in a visual “word cloud” like structure, hovering around the table in a random orbital pattern that can be user or presenter initiated. Original cohesive concept creation for installations throughout the environment gives visitors a unified feeling during their tour, while at the same time, telling individual stories at each spatial touch-point. The following video by AVI-SPL, showcases the Technology Experience Center as a whole, and specifically the equipment powering the interactives. Videos and photos by Downstream & AVI-SPL.